Dorando Pietri, featured on the left and bottom section of the sheet, was an Italian athlete famous for his dramatic finish and eventual disqualification in the marathon at the 1908 Summer Olympics. On entering the stadium, he took the wrong path and when umpires redirected him, he fell down in front of 75,000 trembling spectators. He fell four more times, and every time was helped up by the umpires. In the end, though totally exhausted, he managed to finish in first place. Pietri's feat touched all the spectators of the stadium. As a compensation for the missing medal, Queen Alexandra gave him a gilded silver cup: an award proposed by the writer Arthur Conan Doyle. Emil Zátopek, featured on the right, is regarded as one of the greatest long-distance runners of all time. From Czechoslovakia he won the gold medal in the 10,000 metre race at the 1948 Olympics, and a further three gold medals at the 1952 Olympics in Helsinki, Finland: in the 5,000 and 10,000 metre races and in the marathon. 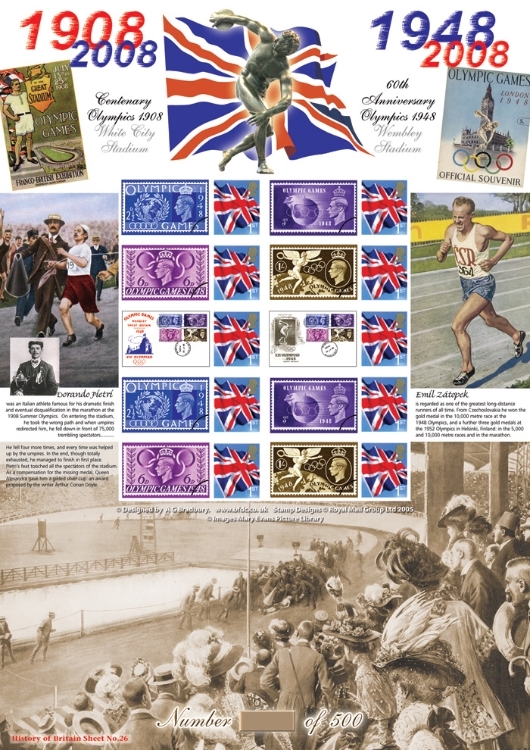 The labels reproduce the 1948 set of four Olympic Stamps issued by the GPO together with a couple of the first day covers produced at the time. I have been granted the right to have this special sheet manufactured by Royal Mail from the International Olympic Committee.